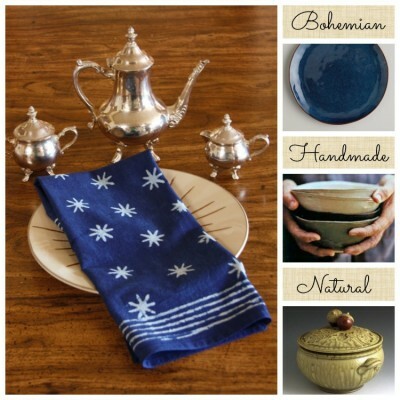 Blog » Shopping Guides » Thanksgiving » Spread Our Floral Table Linens for Bountiful Holiday Style! 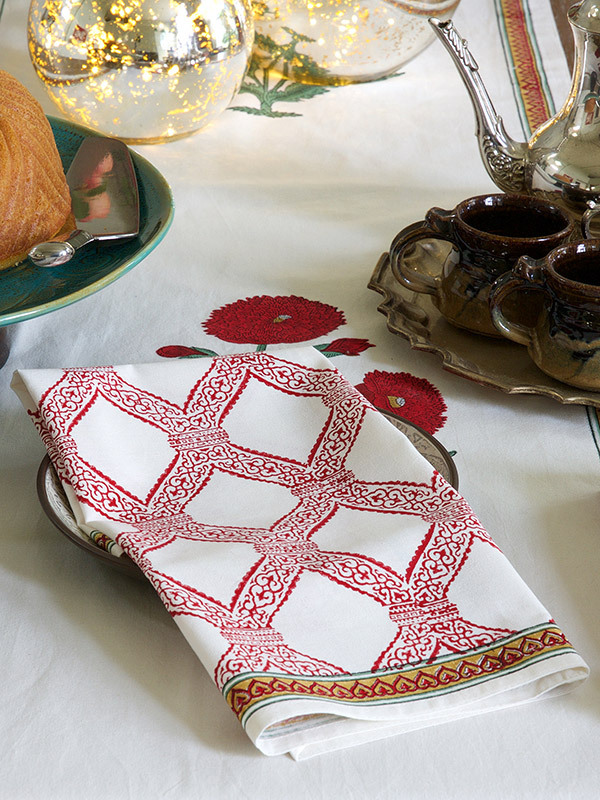 Spread Our Floral Table Linens for Bountiful Holiday Style! 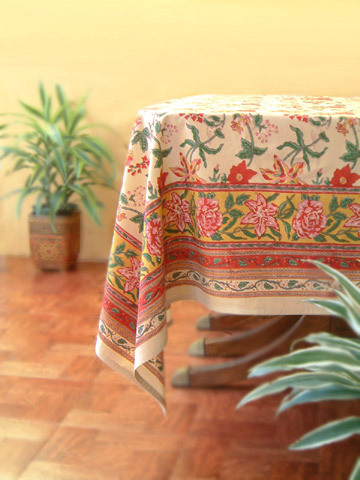 Warm up to our vibrant, hand-printed Tropical Garden floral tablecloth this holiday. All the bounty of the season is gathered in each rich hue of this garden, and it is sure to inspire your unique decorating style. We know that our customers are far from “one size fits all”. So along with our unique, handcrafted table linens, we’d like to share ideas for creating three distinct looks. Of course, mixing and matching is always encouraged! Take a look at Tropical Garden in boho style, with handmade elements, and celebrating everything natural! If you’re a free-spirited hostess who loves vintage style, ethnic pieces, bold pattern, and rich color, Tropical Garden will add just the right Bohemian vibe to your table. I’m sure that our ideas for handmade napkins, and an assemblage of other lovelies will soon have your creative juices flowing! 1. Tropical Garden Tablecloth. It doesn’t get much more festive than this. Bright, hand-printed flowers in rich, natural tones make your table all about the bounty of the harvest. Use a large, round tablecloth at your dining table, or a smaller version at a round dessert or beverage table. 2. Spice Route Dinner Napkins. Because our bohemian spirits love pattern, we’ll layer it on with a tribal chevron print. 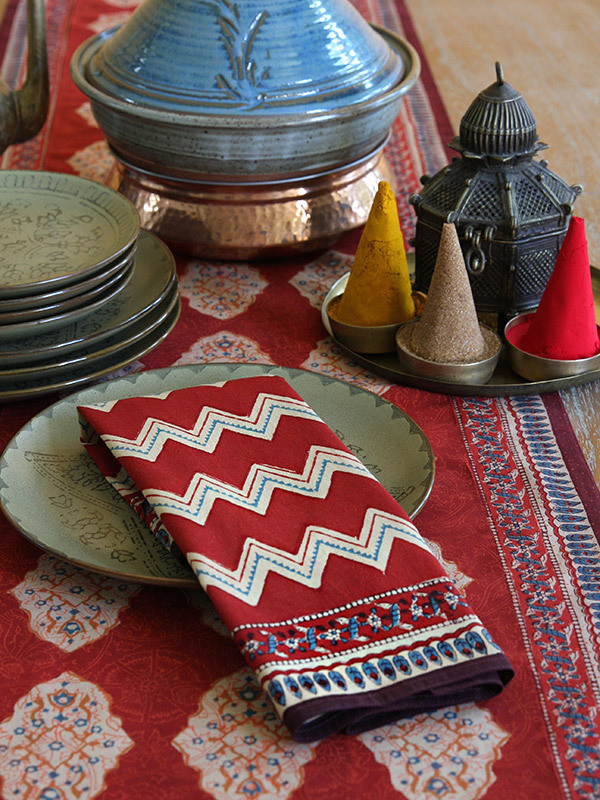 Our artisan-made Spice Route napkins will connect to the color and tone of your tablecloth, but will introduce a new level of exotic to your dinner. 3. Kilim Noir Dinner Napkins. 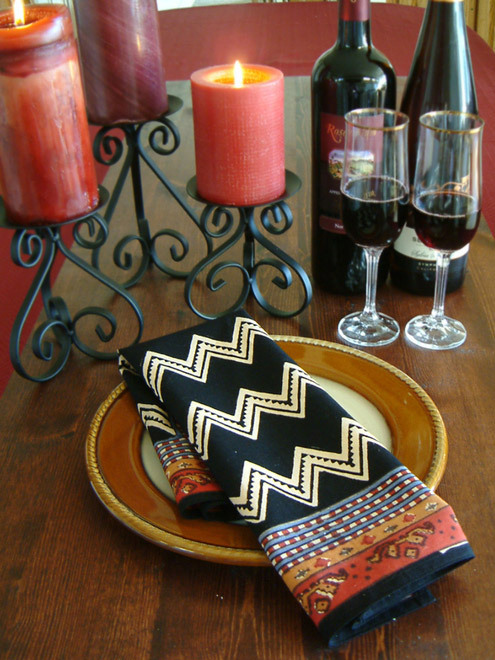 If you want to really catch your guests’ attention, go big and bold with our Kilim Noir black chevron. The black will be a standout, and the russet will connect beautifully with Tropical Garden’s warm tones. 4. 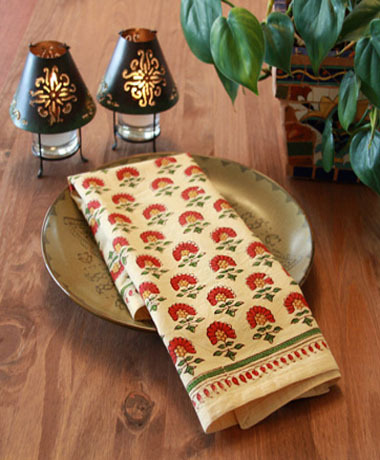 Mughal Poppy Dinner Napkins. 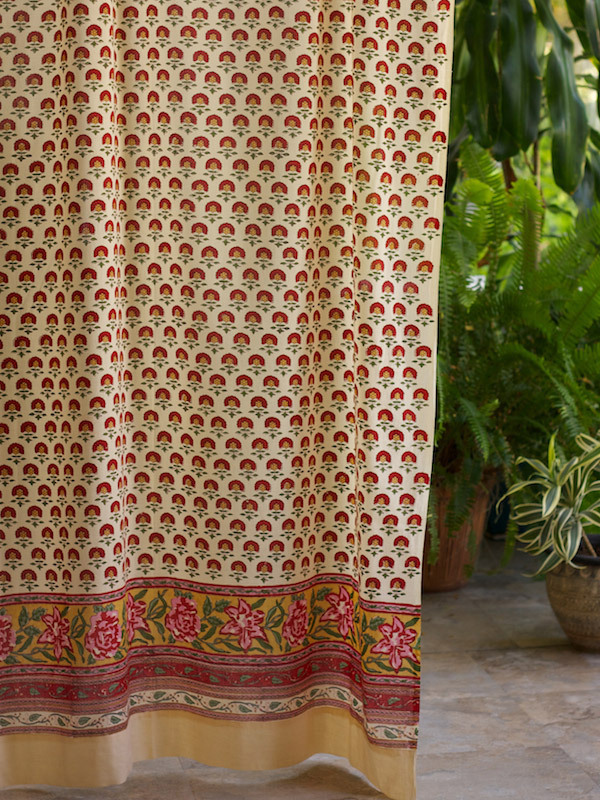 Pull out the brighter reds in Tropical Garden with this gorgeous lattice style print. If you’re serving a few meals in a row (say dinner and next day breakfast), it’s always nice to have a new set of napkins ready to go. Which would you choose? Have I mentioned we have fabulous ideas for accessorizing your holiday table? From exotic window treatments to eclectic tableware, natural centerpieces and global recipes. Try a few of these ideas, and your Bohemian style dinner is sure to be warm, welcoming and wonderful. 1. Tropical Garden Curtain (complement). If you’re interested in creating a whole new scene in your dining room this holiday season, consider the boho wonder of our Tropical Garden complementary print. 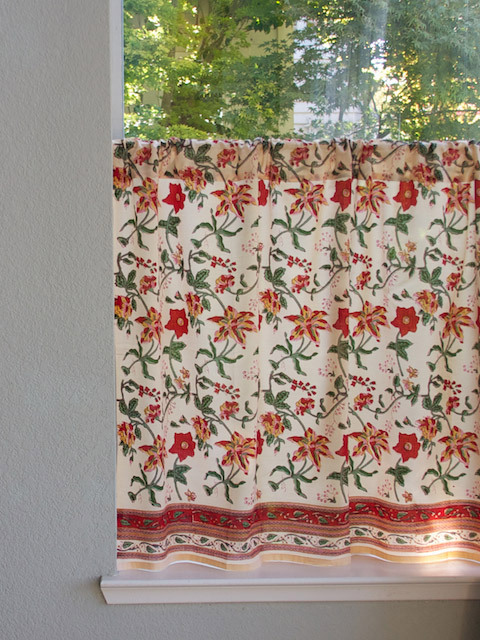 A sheer cotton curtain in this pattern will round out your design and create a richly layered, global space. 2. 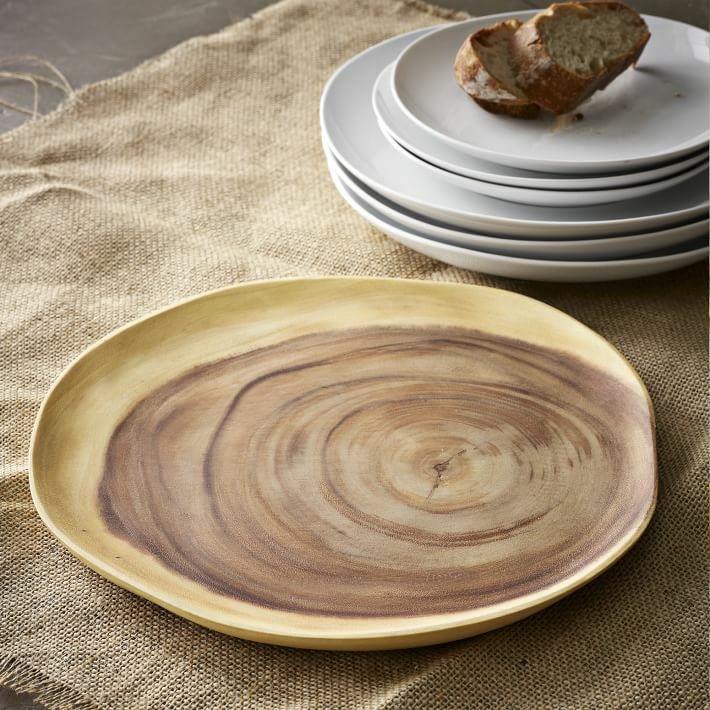 Wood Slice Charger, West Elm. 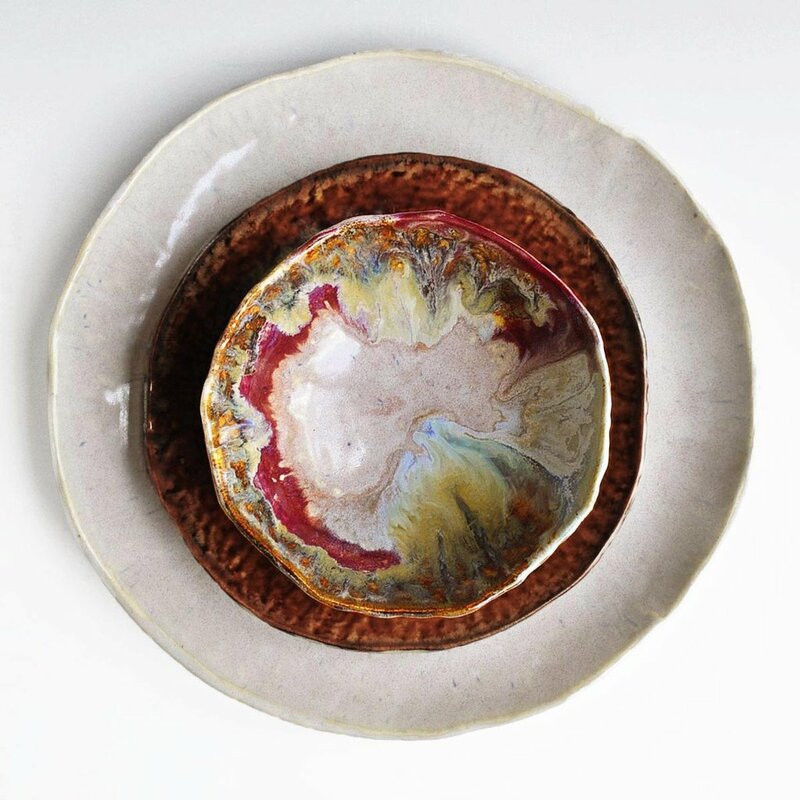 It’s so fun to have a few sets of unique chargers on hand for entertaining… they’ll transform the most functional white plating into fascinating and alluring tableware. 3. Blacksmith Bowl in Vanilla Bourbon, Himalayan Trading Post. Just the right color, just the right shimmer, and just the right style. Add one, three or an entire line-up of these rustic, fragrant, beauties and bring a certain twinkle to your boho feast. Of course, we at Saffron Marigold love the beauty of handmade, hand touched works. 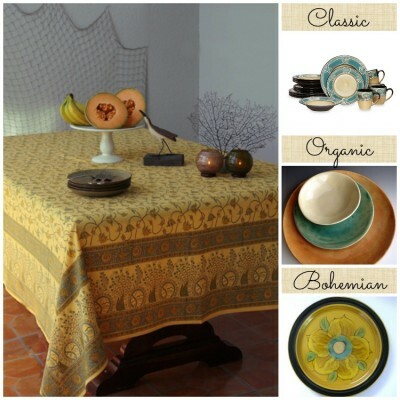 This is, after all, why we are preserving the ancient art of Indian block printing! Let’s get our handmade holiday started by choosing from three lovely handmade napkins. Any of which will be a lovely accompaniment to your Tropical Garden tablecloth! 1. Tropical Garden Tablecloth. 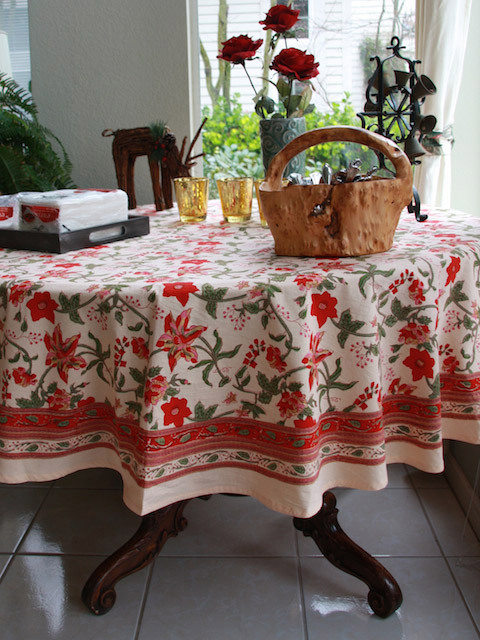 When you’re expecting a full house for the holidays, choose our expansive, hand-printed Tropical Garden tablecloth. Everyone who’s gathered ’round will find something to enjoy in the garden palette at the table. 2. Tropical Garden Dinner Napkins. Our complementary print for Tropical Garden will work beautifully with the main pattern, but not at all in a matchy-matchy way. You’ll love how easy it is to create a look that is unique and hand touched. 3. Green Linen Napkins, Rokasdarby. Soft and rich in color, these handwoven napkins will contribute to the garden bounty theme at your table. 4. Orange Blossom Dinner Napkins. 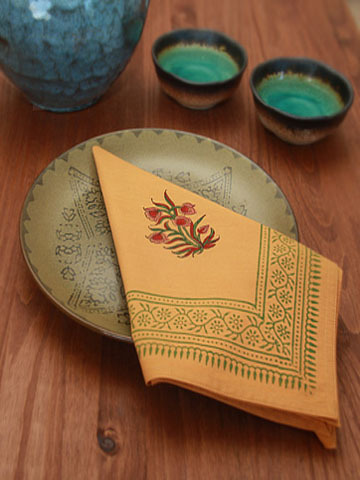 Lovely yellow and orange hand printed napkins will add interest and beauty to your table this fall season. Add dimension to your floral table with these unique linens! Thanksgiving time just lends itself to natural, organic and handmade design. The ideas of working hard to create a wonderful dinner for friends, and of celebrating the bounty of the land with loved ones are ones that speak to the heart. If you love unique wears that are made with love, you’ll love the handmade Tropical Garden accessories and recipes we’ve chosen for you. 1. Tropical Garden Beaded Valance. 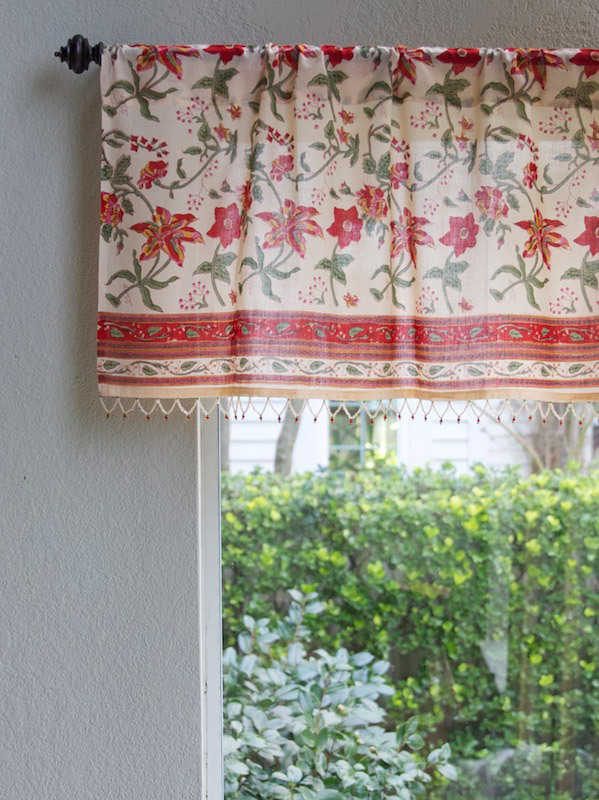 Edge a window or doorway with this cheerful and sparkled handmade valance to create a look that moves about your space. 2. Earthborn Pottery Bowls. 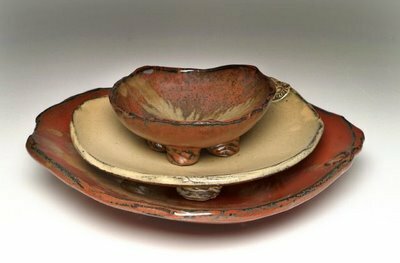 While you’re at it – exploring the vibrancy of fall, that is – why not add to the fun with these beautifully glazed, organically shaped stoneware bowls? If you’re interested in one of a kind – and I think many Saffron Marigold customers are – then these may be just what you’re looking for. 3. 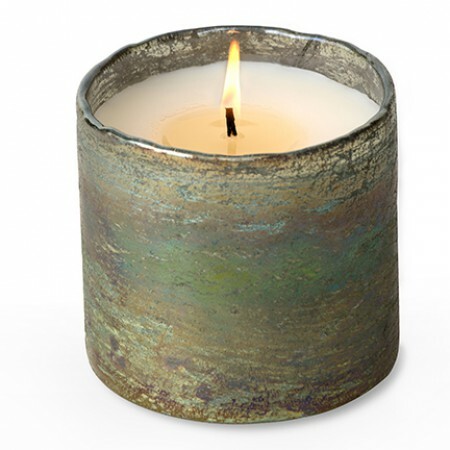 Moss Green Tumbler, Himalayan Trading Post. 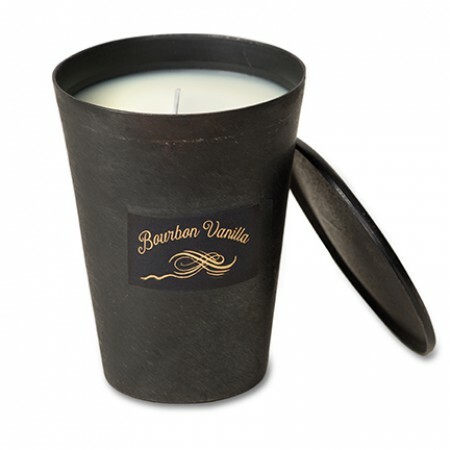 Eco-friendly waxes combine to make for long burning, and beautifully packaged candles. Integrate these with found objects and treasures from your nature walks for a fresh centerpiece. The theme of this print is nature’s bounty, so it only follows that we’d be able to create a wonderful theme of nature-inspired pieces and organic materials. If you’re more likely to be found outside digging in the dirt, or taking a hike, then these ideas are for you. 1. Tropical Garden Table Runner. 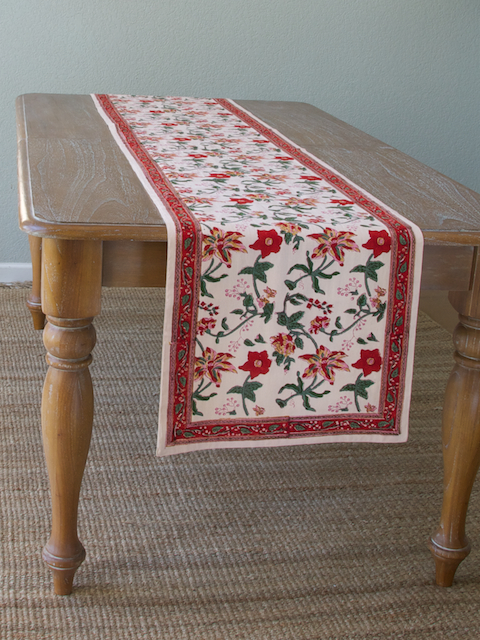 Use our fabulous hand printed, cotton table runner if you want a chance to show off the gorgeous natural grain of your table below. This runner will also be splendid atop a natural dyed solid color tablecloth. Beauty! 2. Indian Summer Dinner Napkin. The lovely ochre hue of our Indian Summer dinner napkin, and the simple red flower in its center will create a vivid garden-like scene at your Thanksgiving table. Enjoy all the color! 3. Golden Days Dinner Napkins, Ich Cha. Gorgeous dyed napkins alongside our Tropical Garden runner will create a perfectly rustic, nature-inspired look. 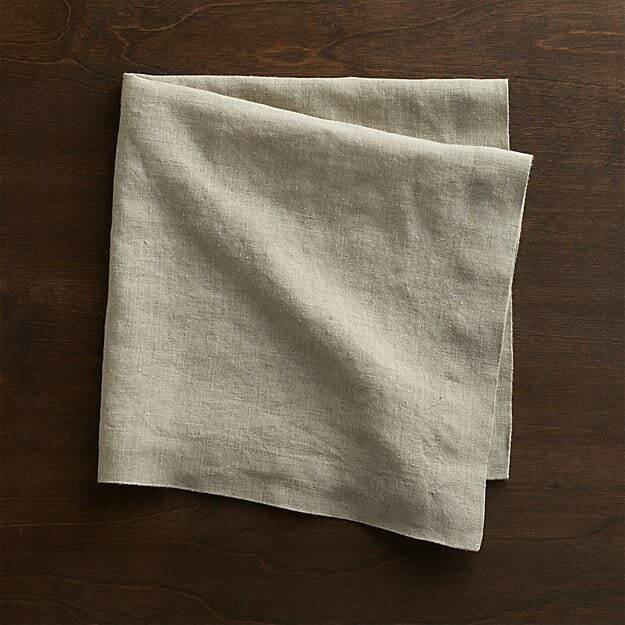 4.Helena Dark Linen Napkins, Crate & Barrel. 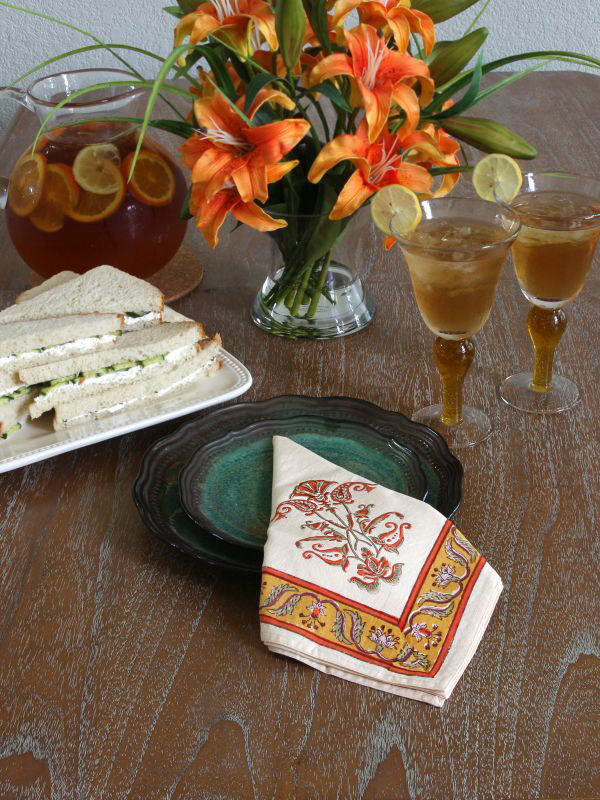 I love creamy linen in combination with our active Saffron Marigold table linens. 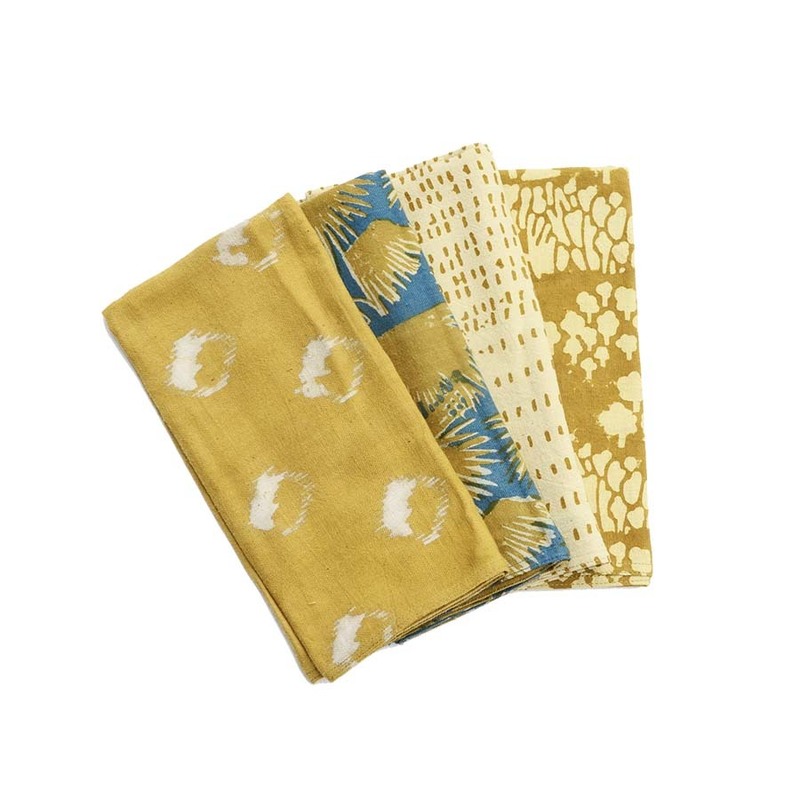 The softness of natural fibers make them a wonderful complement to our artisan made prints. Accessorizing with organic elements, nature inspired design and harvest bounty makes for a rich table! Use colors that are rooted in earth tones, undulating patterns, and bits collected from the outdoors. Along with your natural decor, consider local farm raised fare and delicious all natural ingredient baked goods! 1. Tropical Garden Kitchen Curtain. Your dining room may lend itself to using a shorter kitchen curtain–an excellent choice if you want to let in light and catch some glimpses of the colors of fall out of your windows. 3. Brass Vases, Jamali Gardens. 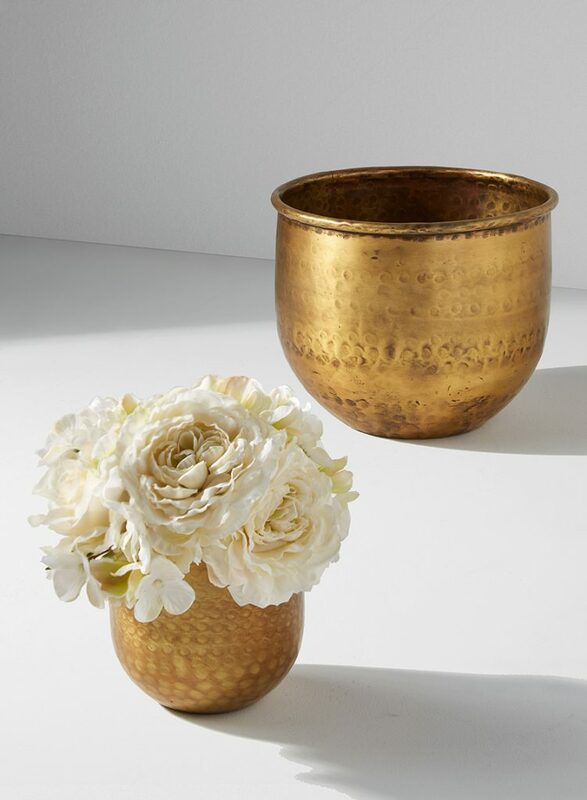 Consider this: fill these lovely pieces with seasonal greens and berries, and surround them with delicate tea lights. Small bright flowers among flickering candles will create a wonderful scene at your table. Whatever your design mantra is, we have inspiring ideas and helpful suggestions for you. Use a couple of these ideas, or mix and match with a few of your own, for a really memorable holiday table that reflects your unique, authentic self. Celebrate! Spread Our Starry Nights Tablecloth, and Dinner Sparkles! 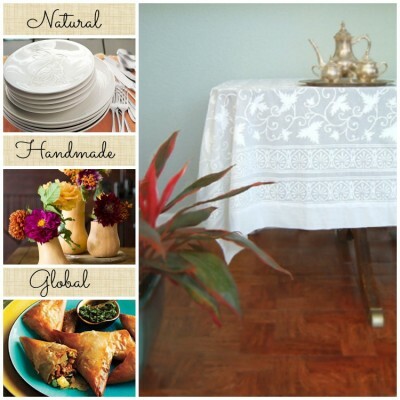 Showcase Your Style with Handmade White Table Linens! I think these linens call for beautiful red flowers and maybe white china. Beautiful! Tropical Garden makes me happy! I would pair it with my yellow dishes, some square, some round, for a more eclectc look. And the centerpiece would be a riot of every color of flower in my Bauer green vase. Ooh, my pretty Thanksgiving pie pan would look gorgeous sitting on top of that tablecloth…! I’m thinking that you could have a lot of fun with the little colored glass rocks (picking up the colors of the table cloth), an assortment of glass bottles/containers and some candles. I think I would use pale yellow glass and red candles. Depending on how it looked small flecks of green might look nice mixed with the yellow glass though of course a green ribbon could always be glued to the outside bottom of the jars. Alternatively there is a cake stand from Target that would look nice with the above products: Threshold™ Glass Cake Stand – Sun Eclipse. Filled with Passion or Star fruit you’d have a lovely and tasty focal point. My favorie is a bowl of red camelias floating in a couple inches of water! I would love these linens for a perfect family board game evening. We’ll be dishing out the pumpkin pie and passing the post-meal snacks just as game time starts, and this would be beautiful spread on the table. The perfect centerpiece? A game board, of course!